Garage door springs are one of the first things to break because of the strain they are under countering the weight of your door day in and day out. A broken spring may slant your open door to one side because the weight is unevenly distributed between the broken and working springs. It may also mean that your door is unable to open. An opener alone can't lift a heavy door, and repeated tries can damage those parts as well. Openers are also often at fault in a broken door, with a burned out motor or worn down chain, belt, or screw. If your door opens manually but not remotely, we'll check the motor to make sure that it's running properly. If your chain or belt is broken, your motor will run but the trolley won't move. Openers that use jackshafts must be repaired by a professional to avoid injury from the cables or torsion rods. If your opener is operating fine but keeps trying to open or close the door on its own, we'll take a look at the close limit switch to make sure that your motor gets the correct signals. Occasionally, a door can come off its tracks due to very worn rollers or an impact that bends the tracks. Storms or vehicles can cause damage to the panels of the door, requiring extensive repair or replacement. No matter the issue with your door, we can provide the service you need with top quality parts. Whether your problem is common or unusual, our experienced technicians have got you covered. 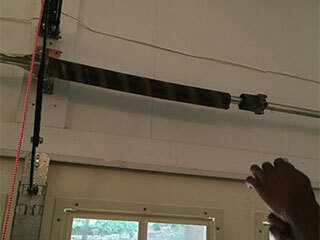 Garage Door Repair Tomball is the most reliable name in the industry when it comes to quality repairs and replacement. Call now to set up a service call from one of our technicians.